In the Bisnode international corporate rating system, the financial stability and business reliability of enterprises are rated based on an age-old system that has been designed by international credit experts. Bisnode’s rating system has been used for rating companies since 1908. Such certificates are used in several countries across Europe, and in the Nordic countries they are considered to be the de facto credit rating system. 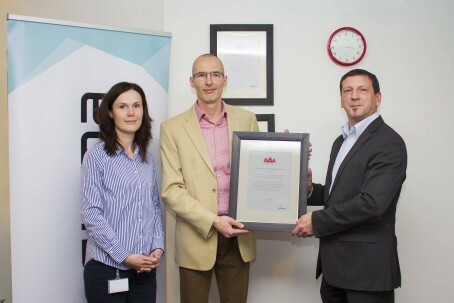 An AAA (triple A) certificate means that Sigma Technology Hungary belongs to an elite group comprised of a mere 0.63% of companies in Hungary (or 1 in about 160), and it indicates that the financial risks of establishing business relations with the company are extremely low. “The Bisnode certificate shows that Sigma Technology is a trustful supplier that delivers high-quality solutions, not just promises, and makes continuous investments into its operation. It also means that we are a good customer for own suppliers, and a trustful employer,” says György Nagy, Country Manager at Sigma Technology Hungary. “To put it in another way: Sigma in Hungary is building a circle of trust, which encompasses everyone we come into contact with, from customers to suppliers and employees”. For more information, contact György Nagy.